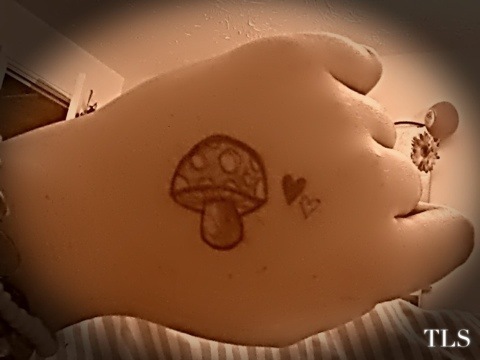 ‘Shroom Doodle. | details in the fabric.. When you’re sat in some class, bored to death, you often have to resort to using your hand as a canvas, and creating something mildly entertaining. I’ve always loved how mushrooms look. But not a fan of the taste. I draw a lot of mushrooms (I get bored a lot), and I’ve been frequently corrected that they’re technically ‘toadstools’. But to me they are mushrooms. Or ‘shrooms, as they are commonly referred to in my head. Previous Cuddles with Casper. Next An English china teacup. Containing tea this time. (No plants). LOL :D good one TLS. i cant draw even if my life depended on it. hence my appreciation for art. Very Super Mario Brothers of you. Do people even know what that is anymore?